Mr. and Mrs. Willis Parker spent their latter years in this home. The home is located adjacent the Valley River and approximately 350 yards from the Willis Parker--Johnson Greybeard Cemetery*. Willis' father, Jonathan Parker, is interred adjacent this house in the Jonathan Parker Family Cemetery. Birth: 1792 Surry Co., N.C.
Death: JUL 1866 Cherokee Co., N.C.
Father: Parker, William S. , Sr. The Parkers were very close friends with the Blythes, Greybeards (Census sheets sometimes reflect Graybeard), Adams, Welches, and Whitakers. After the American Civil War, many Parkers relocated to Delaware and Sequoyah Counties, Cherokee Nation (one of the Five Civilized Tribes and former parent to the Eastern Band of Cherokee Nation), Oklahoma. Their son James may have served in the 6th North Carolina Cavalry Regiment. For more information about the 6th Cavalry Regiment of North Carolina, see: Western North Carolina Civil War Regiments, aka Mountaineers; Highlanders. Prior to the Civil War, Jonathan and most of his descendants were farmers. Jonathan first settled on Jonathan's Creek in Haywood County (then part of Buncombe County). Family tradition has it that Jonathan's Creek was named for Jonathan Parker. Jonathan moved to Cherokee County in 1829 and acquired a large boundary of land near Marble from the state of North Carolina. Also, this land later had several marble quarries and three talc mines, and the finishing plant of the Columbia Marble County. Jonathan Parker raised his family in Valley Township, Cherokee County, N.C.
PARKER--(Mrs. Rhuell Parker and Pearl Parker). Jonathan Parker m. Nancy Anna Blythe. 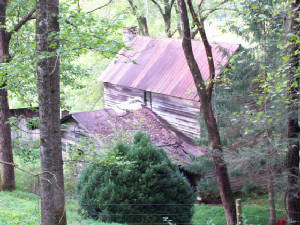 The family moved from Haywood County, then Buncombe County, to Valley River about 1830. He took grants of land presently owned by the Columbia Marble County. He reared a family of ten children. When the stars fell in 1833, John A. Parker, then a small boy, was in the yard. He called his mother to get up, saying, "All the stars are falling." She told him to go back to bed, that all the stars wouldn't fall. She didn't get up and missed seeing the fearful spectacle. sound mind do make this my last Will and Testament. or at the will of my friends. it has please God to bestow ? me with in this life. John Parker as my Lawful Executors. thereto for the purposes therein contained. WILL: In his Cherokee County Will signed 20 May 1866, Jonathan Parker names his wife and two sons: Willis and John Parker; proven in the July 1867 Court. Her half-brother Jackson Blythe served as a (Brevet) 2nd Lieutenant, Co B, in Thomas' Legion of Indians and Highlanders. Death: 1865 Rabun Co., GA..
PARKER, William 2100010000000-0120010000000 8 " " "
CENSUS: 1840 Unknown District, Cherokee County, NC: Johnthan Parker 2M under 5, 1M 5-10, 1M 15-20, 1M 20-30, 1M 40-50, 1F under 5, 2F 10-15, 2F 15-20, 1F 40-50. CENSUS: 1850 Unknown Township, Cherokee County, NC: 790/790 Willis Parker 31M Farmer 75 NC, Adaline 22F NC, John R 7M NC, William 5M SCarolina, Louisa M 3F NC, Sophia 1/12F NC. 1850 Unknown Township, Cherokee County, NC: 775/775 Johnathan Parker 60M Farmer 1000 SCarolina, Leomi 53F SCarolina, Leomi 23F NC, James 18M Farmer NC, William A 16M Farmer NC, Joseph 14M NC, Mary A 12F NC, Clarinda (L?) 3F NC, Jasper Moss 17M Laborer NC, Harret Moss 12F NC, Polly Moss 10F NC, Lucinda Moss 8F NC, Lauretta Moss 5F NC. 1860 Murphy PO, Murphy Dist. Cherokee County, NC: 1427/1427 Willis Parker 41M Farmer 1000/1500 Macon County, NC, Adaline 33F Wilkes County, NC, John R 16M Cherokee County, NC, William 14M Cherokee County, NC, Lewesa M 12F Cherokee County, NC, Sophea E 9F Cherokee County, NC, Eugene 6F Cherokee County, NC, Joseph 4M Cherokee County, NC, Edwen A 2M Cherokee County, NC. 1860 Valley Town PO, Valley Town District, Cherokee County, NC: 1369/1369 Jonathan Parker 68M Farmer 3100/1000 Union County, GA?, Leoma 62F Greenville Dist, SC, Frances Adams 39M Jackson County, NC, Mary Ann 21F Cherokee County, NC, Lucreta 2F Cherokee County, NC. 1870 Valley Town Township, Valley Town PO, Cherokee County, NC: 23/23 Parker Willis 51M Farmer 400/500 NC, Adaline 43F Keeping House NC, William 25M Farm Laborer SC, Mariah 21F At Home NC, Sophia 18F At Home NC, Parker Eugenia 16F At Home NC, Joseph 13M Farm Laborer NC, Augustus 11M Farm Laborer NC, Jefferson 9M Farm Laborer NC, Mary 6F At Home NC, Johnathan 3M At Home NC. 1900 ED 9, Valleytown Township, Cherokee County, NC: 289/289 Parker William B Head Dec 1845 54 M 25 SC NC NC, Clarinda E Wife June 1848 51 M 25 7/5 children NC NC NC, Florence B Daughter May 1873 27 S NC SC NC, Charlie V Son Aug 1875 24 S NC SC NC, Gustus E Son June 1880 19 S NC SC NC, Daisey Daughter July 1883 16 S NC SC NC, Mary M Daughter Jan 1885 15 NC SC NC, Willis Father Apr 1819 81 Wd NC NC SC, John Uncle July 1821 78 Wd NC NC SC. About the Author: John Preston Arthur was born in 1851 in Columbia, South Carolina. After relocating to Asheville, North Carolina, in 1887, he was appointed Secretary of the Street Railway Company, and subsequently the Manager and Superintendent until 1894. Later, after becoming a lawyer, he was encouraged by the Daughters of the American Revolution (D.A.R.) to write a history of western North Carolina. She covers such topics as the importance of staying organized and how to go about it; where and how to look for information in libraries, historical societies, and on the internet; recognizing that just because something is in print doesn't mean it's right; and how to prepare to visit the home where your ancestors lived. Genealogy 101 is the first book to read when you want to discover who your ancestors were, where they lived, and what they did.